As 2015 draws to a close, we’ve made huge strides in using technology to improve workflow processes and information management across all industries, particularly medical. Earlier this month, our staff attended the HIMAA NCCH conference in Sydney which considered ways in which the medical industry can use technology to improve data management and in turn patients care. With a younger generation of medical practitioners, nursing staff and records managers using technology, the medical industry is going through a transformation that will see a strong push towards paperless records in the working environment. Greater automation of workflow processes in medical records management means less energy spent on paper recordings, filing and retrieving documents. Plus improved accuracy of information and easy access by all medical practitioners involved in patient care. These are all positive benefits likely to bring about significant enhancements of the medical industry and most importantly care for consumers. The downside is the potential risk of databases being hacked and data loss or misuse. Not surprisingly medical data is 10 times more valuable on the black market than financial information? Why? Because it is provides a host of opportunities for illegal operations including; insurance fraud, blackmailing, accessing prescription drugs, and overseas intelligence or terrorist organisations. According to the 2015 KPMG Healthcare Cybersecurity Survey, 81 % of American healthcare executives claim that their organisations have been compromised by at least one malware, botnet or other cyber-attack during the past two years. Of those 231 executives surveyed in the US, over half felt that they are inadequately prepared to prevent an attack. In Australia, the threat is equally real with an alarming number of security breaches of government departments. Recently, the Western Australia's auditor-general, Colin Murphy, found at least two examples where State Government databases could easily be hacked. In one case, medical records were accessed through inadequate password protection, and in the second through “backdoors”, created to access data at a later time. Australians have been able to register for their own personally controlled electronic health (eHealth) records since 2012. The eHealth record is an electronic summary of a person’s health information that contains medical history, treatments, diagnoses, medication and allergies. Consumers can choose which health care providers have access to it, and the information contained. Understand the eHealth records T&C before opting in. Know how your eHealth records are being collected, used and disclosed. Set your access setting on registration and review your access list regularly. It’s important to do this, as you may have different health care providers. Use a strong password and access your eHealth records through a secure system. Consider establishing an “access code” and giving this to “approved providers” only. Know the privacy policies of healthcare providers and the eHealth records System Operator. You may not be able to restrict access by individual staff. Consider the types of information contained in your eHealth records. Discuss with healthcare providers; you can request to add or remove information. However, it’s important that all relevant and current information is available in case of an emergency. Check your eHealth record audit trail regularly to determine any unexpected or unauthorised access. If concerned notified the Systems Operator. For more info call Secretary of the Department of Health, System Operator 1800 723 471 or click below. 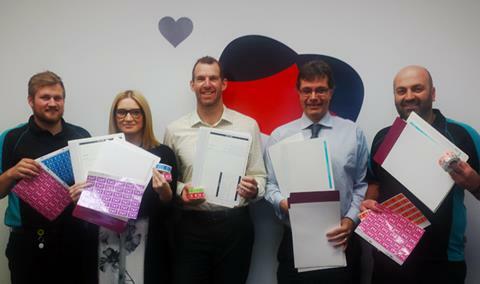 Kathrine Caulfield and her partner Paul began with a small stationery shop in the 1990s to capture an opportunity in the South Australian market with a new filing solution that ultimately gained the attention of TIMG. Late last year, TIMG acquired Global Filing Solutions (GFS). Kathrine and the TIMG team now offer GFS products and services to all our clients throughout Australia. GFS grew from humble beginning fulfilling the stationery supply needs of many small businesses in Adelaide. Kathrine noticed that Doctors were using small index cards and drawers to record patient information. This meant that only a limited amount of detail was recorded and additional documents had to be folded to fit. Kathrine recognised a smarter way and introduced lateral shelving systems with vertical files to improve efficiencies in filing, saving both space and time for Records Managers. Cumbersome four drawer filing cabinets were replaced with sleek, easy moving Lateral Compactus systems. Non-descript manilla folders became fun Alpha Numerical colour coded files with easy to understand coding labels proving a great hit. Clients ranged from small accounting firms to large government departments in South Australia. “We were one of the first companies to introduce the lateral filing system in South Australia. Our clients loved it. Especially, as we provided onsite support, helping them to set up new archiving systems and convert old systems. As time went on and more clients were using less paper, we realised a new opportunity to help clients manage their electronic documents. Combining our knowledge of archiving with TIMG’s expertise in off-site document storage and e-business, is a bonus for our clients and a competitive edge for us,” said Kathrine. GFS commitment to customer service is in line with TIMG’s client-centric culture. Kathrine and her team continually provide value-added benefits for clients, offering advice on indexing and classification to setting up rules and policy procedures, ensuring everything meets the Australian and International Standards for Records Management AS ISO 15489. 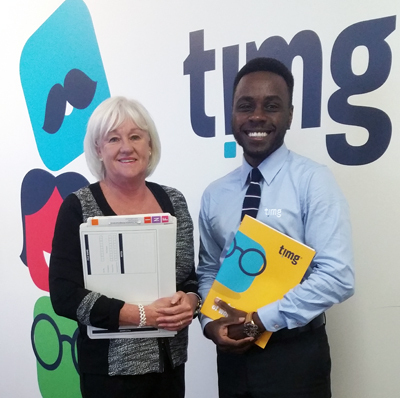 Kathrine in Melbourne with TIMG BDM Roger Wilson, discussing opportunities for TIMG clients. GFS staff showing off their FUN filing products. “GFS Business Unit also provides me with great customer service. I met with Kathrine Caulfield from GFS in relation to barcodes and file covers. At times, I am not sure of the best solution for our filing needs. Kathrine is brilliant at working with me on the issues. Kathrine takes the time to ask questions and listens to what I am saying. We discuss the type of information and files Consumer Business Services (CBS) creates, and how CBS works with the information, and the issues around this. A regional hospital in Brisbane was able to turn around an inefficient and costly information management system with the help of TIMG. Our client came to us, after much frustration with their existing provider, who failed to deliver the service they promised. The hospital experienced considerable delays in receiving files which was causing undue stress for staff and ultimately hindering the quality of care for patients. Furthermore, they were charged for unnecessary cataloguing fees and double-handling. No support was given for maintaining retention records, making culling a daunting task, resulting in a huge backlog and errors. A complete re-organisation of the hospital’s information system from “files in-boxes” to loose file storage. All files were individually barcoded for easy tracking. The process allowed for a thorough audit to determine those files to be retained or culled. TIMG’s software allows for scanning of barcodes “on- the-fly” during pick up or delivery, by our staff, ensuring accuracy and complete security. We instigated agreed Service Level Agreements (SLA) stipulating a two-hour turnaround for urgent deliveries. TIMG is accountable to meet these deadlines and failure to do so, will involve an explanatory report and loss of fees. File requests can be made via phone/fax or through our user friendly software which also enables easy monitoring of files for retention and culling. HIM of Regional Hospital in Brisbane. The overall situation is greatly improved as the Hospital has saved considerable costs on double-handling and storage charges. Boxes are no longer required. Barcoding and tracking of files through TIMG software, makes it simple to locate and retrieve files quickly. Retention dates are easily accessible and monitored allowing for greater efficiency in culling records. In short TIMG has partnered with the hospital to provide a secure and efficient backup for their records management, supported by exceptional service. TIMG has been working with the Health Records Management Industry to incorporate document management systems and technology to deliver faster recording and delivery of medical data. Many business sectors are moving towards paperless working environment; digital solutions could provide the medical sector with significant cost savings and minimise risks in patience care through improved management of data. Late last month, TIMG attend the HIMAA NCCH Conference 2015 that promoted the theme of “Diversify, Innovate, Transform”, to improve workplace processes and deliver better outcomes for patients and personnel. The Conference reviewed advancements in digital technologies to create a paperless information management environment transforming workplaces, among other issues facing the industry. TIMG understands that the time and cost involved in locating files, physically photocopying or scanning and then sending documents to the relevant hospitals is both inefficient and unsustainable. Health professionals need to access patients’ records immediately, especially in an emergency. TIMG can partner with hospitals to provide a physical and digital back-up, plus 24hr support for existing records management systems. 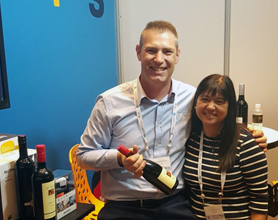 TIMG, Qld State Manager Sean Kays, and Maurice Hewson SA State Manager were on hand to discuss these issues with delegates and offer solutions for improving efficiencies and delivering real cost savings for the medical industry. 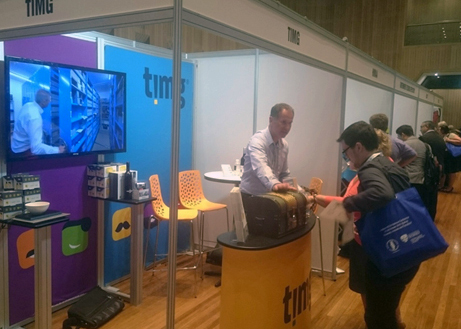 Maurice Hewson hard at work on the TIMG information stand. 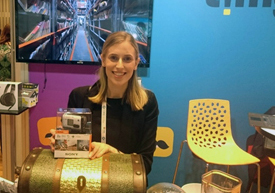 Well done Laura from NSW Health for opening the TIMG treasure chest and winning the Sony camera..
Sean Kays congratulating Letalia from WA on her win. Over $10,000 will have been raised through the sale of media tapes for the Prostate Cancer Foundation of Australia, by the end of 2015. TIMG is proud to have been part of the campaign to raise awareness and funds to support the Foundation. Alarming statistics show that one in seven men risk getting prostate cancer by the age of 75 years. The risk increases to one in five men by the age of 85, according to the Prostate Cancer Foundation of Australia. Although research for a cure continues, many types of treatments are readily available. More concerning is the reluctance by men to discuss the issue and seek medical help. Early detection of the disease through screenings is strongly encouraged to give men a greater chance for a full recovery. With only a few days left for the Movember campaign, we urge all to support the campaign. For businesses using media tapes to back-up your data, TIMG DABware is donating 10c from every LTO Blank Tape ordered towards the Foundation. Media tapes provide a secure option to backup your data. To mark the end of another fantastic year for TIMG, we would like to reward our clients and supporters with a chance to win a $250 holiday experience gift voucher, for anywhere in Australia. Forward TIMG eNews to 2 or 3 colleagues/ staff or business associates via the forward icon in the newsletter footer. Please DO NOT SPAM, just send TIMG eNews with a note saying that you found the newsletter interesting and thought they may be interested in reading it too. Like TIMG eNews on our social pages, and follow us on our social media platforms. Competition closes: Friday 8 December. To enter: Send us an email to competitions@timg.com , with subject heading: Holidays Competition, plus your contact details, name and telephone, confirming that you have completed the above requests. Entries will close 8 December, 2015. Winners will be notified by email and announced in December’s issue of TIMG eNews. The Information gathered through the competition will be used by TIMG for marketing activities. In accordance with the Privacy Act, TIMG will ensure your information is stored securely and NOT shared with any third party. Employees and contractors of TIMG are ineligible to enter. Contact your local TIMG office on 1300 764 954 for a complimentary review of your information management systems and to improve your workflow processes. While every effort has been made by TIMG to ensure that the information contained in the e-news is up to date and accurate, TIMG does not give any guarantees, undertakings or warranties in relation to the accuracy completeness and up to date status of the above information. TIMG will not be liable for any loss or damage suffered by any person arising out of the reliance of any information in this newsletter.